Bohol, for all its beauty and charm, offers a wide array of tourist attraction and activities to keep every traveler busy. Boredom is the last thing you will ever have to think about as soon as you step in this magical island. When planned right, you can actually have a memorable experience traveling around Bohol in one day. Here are the 7 things included in our itinerary that you might want to try. I hope that this will give you some idea the next time you’re planning a trip to this exotic paradise soon. 1. Take an early morning dip at the Bohol Plaza Resort’s swimming pool. 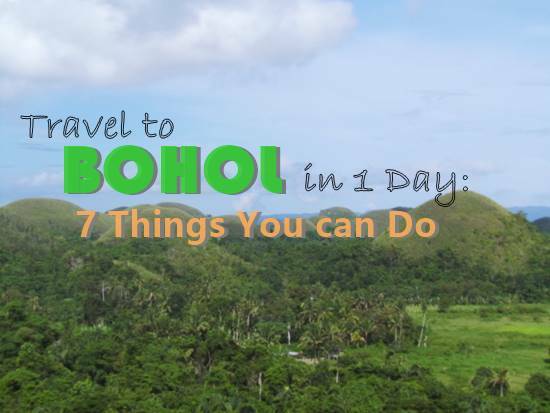 Want to prep yourself up for an exciting day-long adventure in Bohol? Taking a quick dip in a swimming pool early in the morning is a great way to keep yourself fully awake, boost your immune system and burn some calories before embarking on your next destination. My friends and I stayed at Bohol Plaza Resort over the weekend and we can’t help but enjoy ourselves swimming in their huge pool while luxuriating at the lush greenery surrounding the resort. 2. Try The Buzz Cafe’s organic all-day meals and desserts. I am in love with their ice cream! Let’s face it–organic meals are few and far between. There aren’t that many local restaurants and cafes here in the Philippines that feature healthy and organic cuisine. And when you do find one, they would probably cost you an arm and leg. 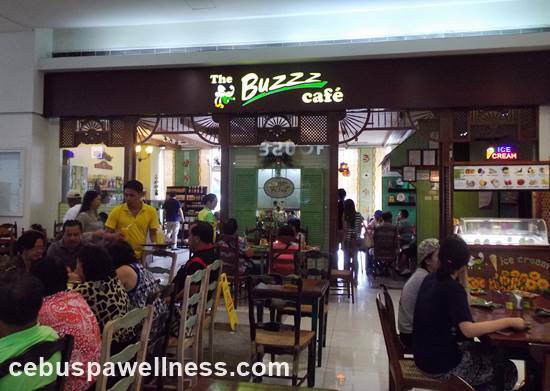 I was extremely pleased to be able to try The Buzz Cafe’s famous organic ice cream which includes different exotic selection like spicy ginger, durian, guyabano, dragon fruit, malunggay and others. Each scoop retails for P50 (as of September 2015) and the ingredients are organically produced from their farm without any preservatives added. Aside from the ice cream, they also offer delicious all-day meals that will surely satisfy every foodie and casual diners. 10/10 will go back to Bohol for their organic ice cream. 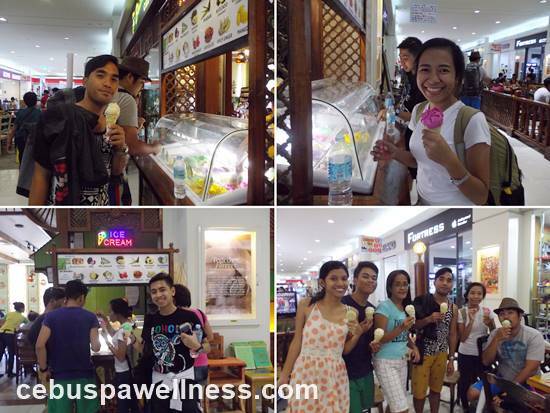 We simply can’t get enough of The Buzz Cafe’s organic ice cream. Sandugo, a Visayan term for “one blood”, is an important historical landmark in Bohol because it commemorates the blood compact between Bohol’s chieftain Datu Sikatuna and Spanish explorer Miguel Lopez de Legazpi in 1565. As part of the old tribal tradition in Philippines, leaders would slash their wrists, pour drops of blood from their wrists in cup filled with wine and drink it as sign of friendship treaty between Filipinos and Spaniards. I know it is unthinkable to cut your wrists and drink your friends’ blood today but it is worth noting that our ancestors once had the balls to go this far in the name of friendship. 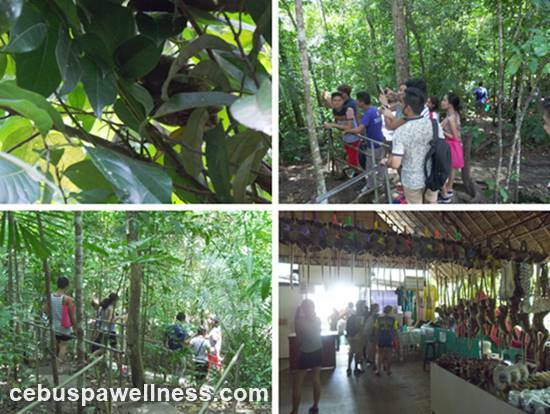 No tour is complete without visiting the Tarsier Sanctuary to see tarsiers in their natural habitat. Philippine tarsiers are endemic to Bohol’s natural forests and they are protected by the Philippine Tarsier Foundation, Inc. The sanctuary’s tour guide told us that tarsiers are nocturnal creatures so they sleep during the day and are active during at night time. It was almost midday when we arrived there, so we didn’t get a good glimpse of these adorable critters because they were sleeping, camouflaged amongst the trees. Just a tip: when going there, please don’t use flash on your cameras and keep quiet so you won’t disturb the tarsiers. The entire tour is swift with a narrow pathway that you need to cross until you reach the end point. They also sell some souvenir items and Boholano delicacies like Calamay and Peanut Kisses. 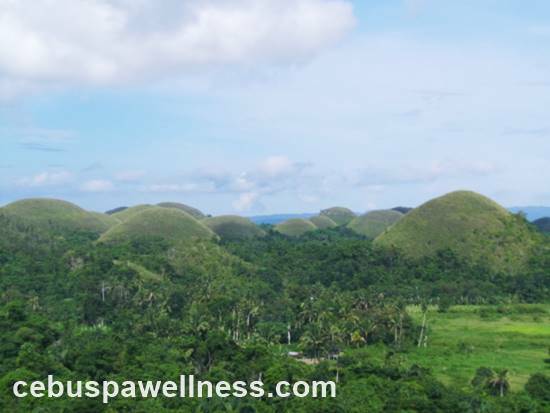 Did you know that Bohol is declared as one of the few provinces in the Philippines that is insurgency-free? Since 2010, Bohol was able to successfully maintain peace and order in the entire island by fighting against communist movement. We were lucky to view their tactical demonstration and the common weapons and tools they used during military operation. Rest assured, they didn’t use real ammunition during the demonstration so the spectators went home safely. You know you’ve reached the man-made forest the moment you see a long stretch of tall mahogany trees along the Loay Interior Road and the temperature suddenly drops, making the area cooler than rest of the island. 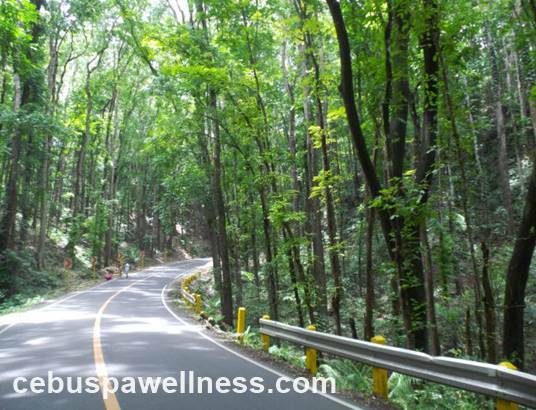 Going there is an adventure in itself, thanks to the steep zigzag road leading to the famed forest after leaving Loboc town. What a better way to end your Bohol tour with a bang than to get your blood rushing from excitement. 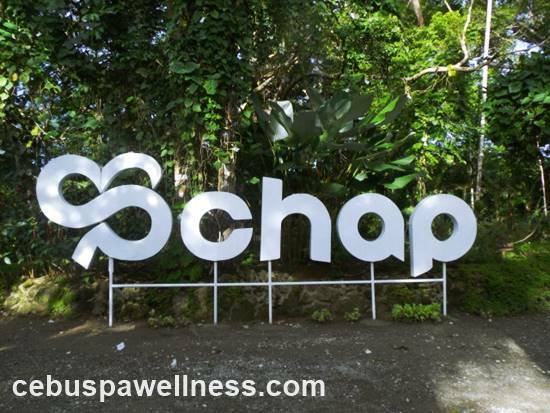 CHAP will never leave adventure-seekers disappointed with its wide array of outdoor activities like the Bike Zip, Tree Top Challenges, Burma Loops, Vine Walk, and so much more. 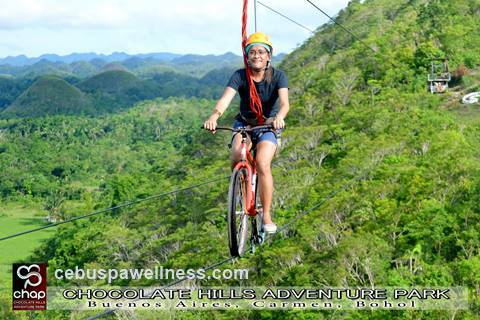 I personally tried the Bike Zip and it was scary at first but it gets awesome as you take in the full view of the Chocolate Hills mid-air. Since we were scrapped for time, we didn’t get to sample other activities but I promise to try some of them when I come back to Bohol next time. Take a leisurely stroll around CHAP. CHAP Bike Zip was worth it! A stunning view of the Chocolate Hills from CHAP. After our last stop in CHAP, we were officially done for the day. Coming from a not-so-seasoned traveler, it is possible to tour around Bohol in one day if you start early in the morning and you don’t waste time in every stop. If we had more time, I’m sure we will have visited more places, like the Loboc Floating Restaurant for one. 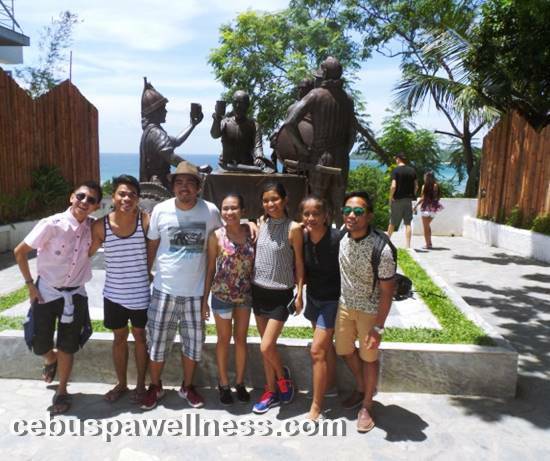 To make your travel more organized and pleasant, it is ideal to read up as many articles about the different places and activities you can do in Bohol, or perhaps coordinate with your travel agencies and the local Bohol Tourism office before going there. The last time I went to Bohol was summer 2013. Stayed at Bohol Plaza too. I haven’t tried #2. But will definitely try in my next trip there before this year ends. I have done this kind of trip several times already, but Bohol never ceases to amaze me. It has always been one of my favorite islands in the whole world. I’ve only been to Bohol twice and just for 24 hours. I’m looking forward to visit those places soon. Really digging into Bilar Man-Made forest! Muadto jud ko once I visit Bohol! Amazing Bohol! We would like to go back and explore the dive sites there.